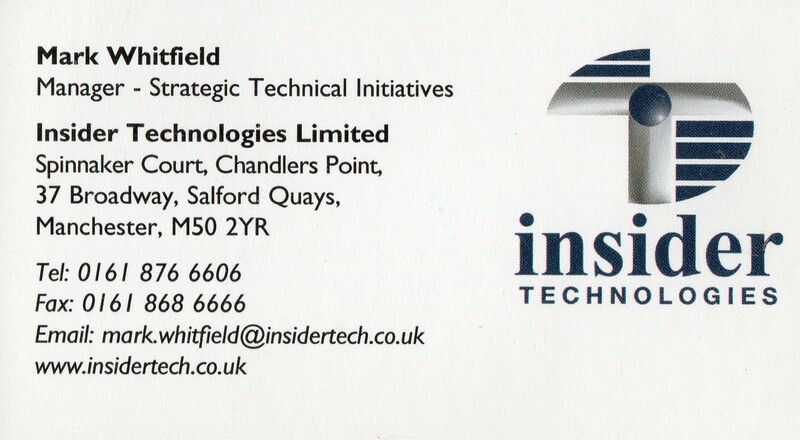 Insider Technologies is an HP Partner, operating in the Financial and Messaging markets. The Company provides Service Management, Tracking, Bespoke Software and Information Mediation solutions. Insider’s product set runs on HP NonStop, Windows, Linux and Unix platforms. 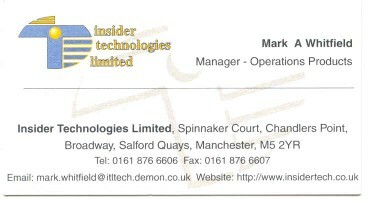 Based in Manchester, England, Insider Technologies Limited was established in 1989 by people with wide experience of the IT industry. From this collective experience, the company grew rapidly with each new employee bringing new skills and expertise. Employed as a Project Manager (certified PRINCE2 Practitioner, Agile – Scrum and ITIL) and Pre-sales Technical Consultant at Insider Technologies Limited (ITL). This role enables me to remain technically ‘hands-on’ for any issues or initiatives that may arise for the company’s primary product set, namely the HP NonStop based banking products Reflex 80:20, Reflex ONE24 and more recently MultiBatch. As part of my primary management role at ITL, I successfully headed up a team to deliver mainframe ATM and point-of-sale monitoring software to HSBC bank in 2008. 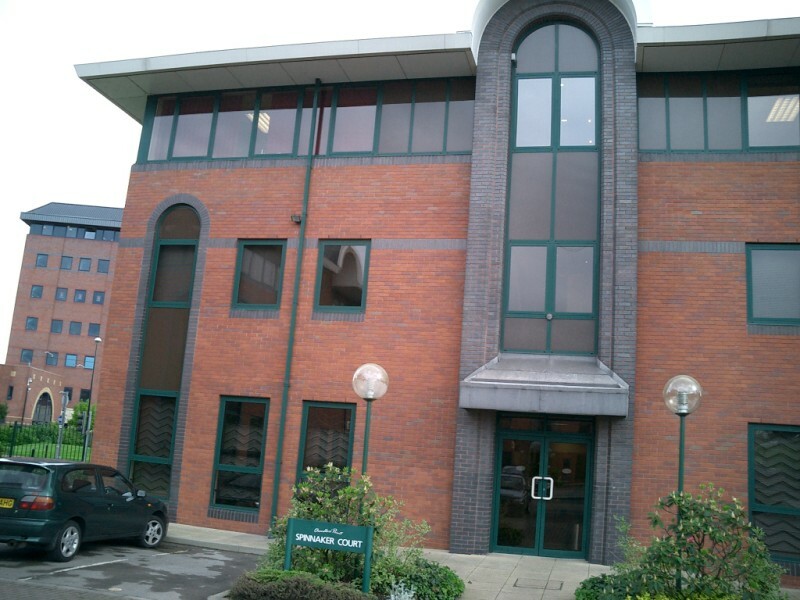 Prior to this implementation, I was heavily involved with the joint architects, Alliance & Leicester (now Santander) with the design, development and project management of the product. Providing 24×7 technical support for; Bank of England, Royal Bank of Scotland and Euroclear (formerly CRESTCo) who provide settlement for 88% of the UK’s equities. Providing 24×7 support for the Thales e-SECURITY products; Security Resource Manager (SRM) which runs on the NSK platform and both SafeSign Authentication and SafeSign Management Server which run on Windows and Unix platforms. These products provide for the request and response of Cryptographic functions (eg. MACcing, Random Number Generation, PKI verification) to an attached banking application. Attended the BASE24 User Group (EBUG) in Madrid, Prague, Vienna, Istanbul, Lisbon, Malta, Budapest and Edinburgh and given presentations for the ITL BASE24 enabled NSK monitoring products as part of the EBUG technical track sessions. I have also attended the San Jose International Tandem User Group (ITUG) and UK BITUG and written an article for the BITUG Newsletter on approaches to hp NonStop Enterprise Management. I have represented the company at the South African Tandem User Group (SATUG) in both 1999 and 2008. As part of the role of managing key technical initiatives for ITL, the following list provides a brief overview of the major projects I have been involved with (see also – ‘Other tasks include’ below). Documentation I have produced to support these initiatives is available on request for perusal as part of the interview process. I have studied the PRINCE2 Project Management Foundation course to aid in my role as IT Project Manager at ITL. 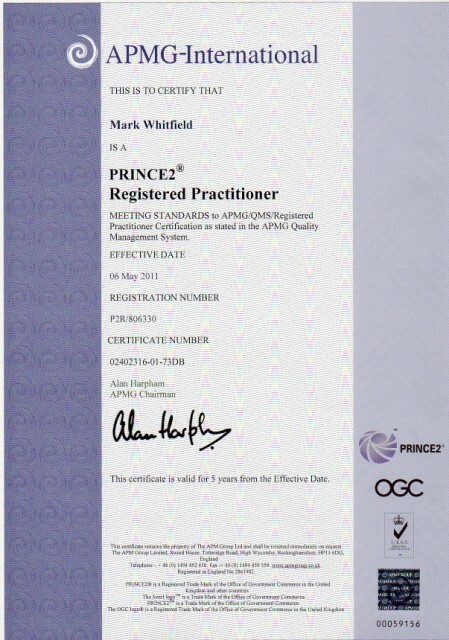 I am now a certified PRINCE2 Practitioner (as of 2011). My last large project for ITL was at Al Rajhi Bank in Riyadh (Saudi Arabia). This involved the BASE24 Classic payment solution and the relay and optimised parsing of multiple Terabytes (10 years) of tape archived POS and ATM transaction logs to ITL’s RTLX product. Since I also have a technical background with the HP NonStop platform, I visited Riyadh many times to provide product presentations, conduct gap analysis work for the product and bring back project requirements for ATM / POS querying, monitoring and reporting. I dealt with the key stakeholders at the bank and the local distributor in Riyadh as well as manage the development team prior to the successful implementation of the product. This bank project was featured in the globally published HP NonStop journal – ‘The Connection’. As part of this exercise, website prominence was a key driver along with a more professional, corporate look-and-feel. The website is an ongoing programme of work that takes up a few hours a week of my time in taking it forward. I have attended 2 gbdirect (iTrain) website courses in this regard; ‘Writing for the Web’ and ‘Website Prominence and Visibility’. More information. Assigned to a team to help develop a new add-on module for an existing Windows based ITL product called Sentra. The new module called RTLX, provides real-time monitoring of both ATM and POS transactions routed and processed by the ACI application, BASE24™. Sentra achieves this by dynamically deploying extraction agents to the HP NonStop platform and relaying (P)TLF data back to the Windows Server (with Microsoft SQL resident) using ITL’s FastPipe product (in-house developed proprietary TCP/IP sockets protocol). My role involved working with two Major Clearing Banks in Bootle, Merseyside and in London to assess their requirements for; Transaction Graphical Monitoring, Real-Time Charts, ATM/POS Queries and Management Reports. As part of the requirements gathering, I provided the project status updates to the Bank’s BASE24™ IT personnel and supplied further technical input to the development team as the project progressed. Towards the end of the first-phase of the project, I helped design and develop the real-time browser based charts and management reports using Microsoft Reporting Services and SQL Server (for building the appropriate SQL Stored Procedures). 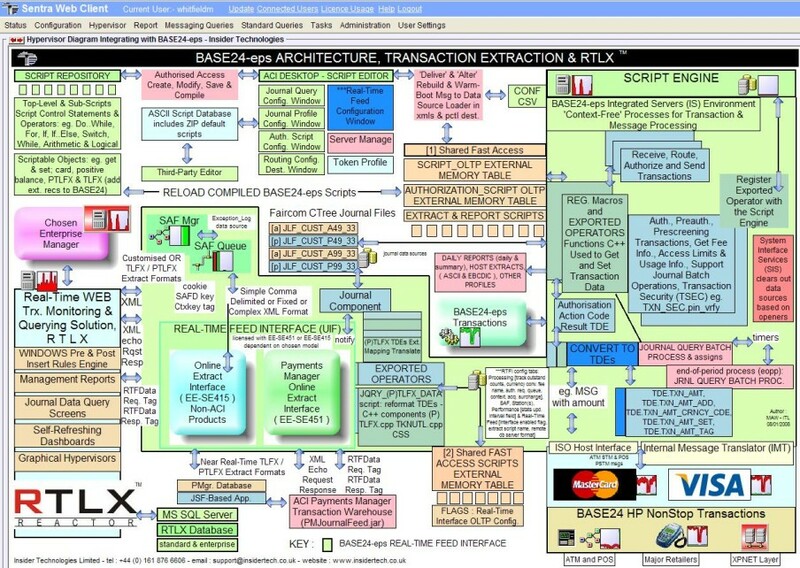 I represented ITL at the 2006 EBUG conference in Lisbon to help launch and promote the new RTLX product extension to other financial institutions running the BASE24™ application. As a result of conversations at the European BASE24™ User Group (EBUG) in 2006 (Lisbon) and 2007 (Istanbul), I assisted the company technical pre-sales effort in helping to secure a contract with a major bank based in Sheffield (UK). This contract required the adaptation of the ITL product RTLX (see Version One below) to monitor a more customized version of the HP NonStop product BASE24™ to that monitored by RTLX version one. The bank’s card acquiring business had no mechanism to monitor the real time transaction flow and look for deviations against normal POS throughput behaviour that would indicate a problem and provide early warning to relevant parties. Monitoring retailer transaction volume shifts and types of transactions and authorisations were amongst the banks list of product requirements. The bank had moved away from the standard deliverable file formats (supplied by ACI) typically used in logging both ATM and POS transaction records, to a more proprietary layout for their TLF and PTLF files. This resulted in a development project in-house, to modify the RTLX file extractor processes on the HP NonStop platform, to read the new record formats and relay the transaction data to a Microsoft SQL database on a Windows Server. The RTLX standard database format, SQL stored procedures, dashboards and management reports all had to be modified to cater for the new file formats as part of the development project. 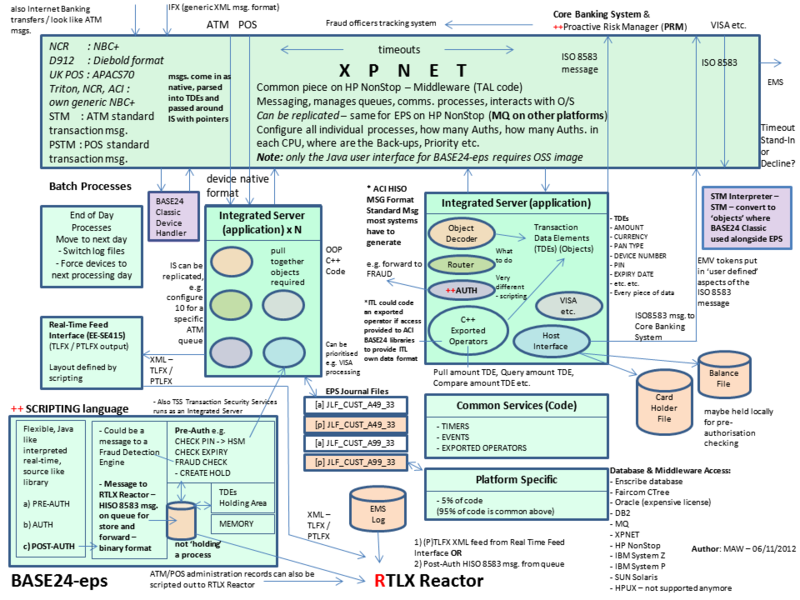 When the contract was secured, one of my tasks as part of the in-house project, was to write the RTLX Technical Interface Specification document. This document details the TLF and PTLF file formats on the HP NonStop platform and the corresponding SQL database columns required to map the incoming record fields to. It also provides a clear indication to the bank of how each of the RTLX software deliverables fulfills the monitoring requirements set down in the user requirements document issued by the bank’s BASE24™ project team. As part of installing the initial implementation of the RTLX product on-site, I was also required to produce the visual graphical displays on which to map the alerts required by the bank. The first of these graphical ‘hypervisors’ was produced for the POS acquiring business and is used to monitor the major POS retailers processed. This display is used to monitor retailers for changes in transaction authorization, denial, referral and stand-in rates. The second display is required by the BASE24™ support area and is used to monitor the status of the entire BASE24™ system with emphasis on monitoring throughput of customer transactions across the interchanges/interfaces. 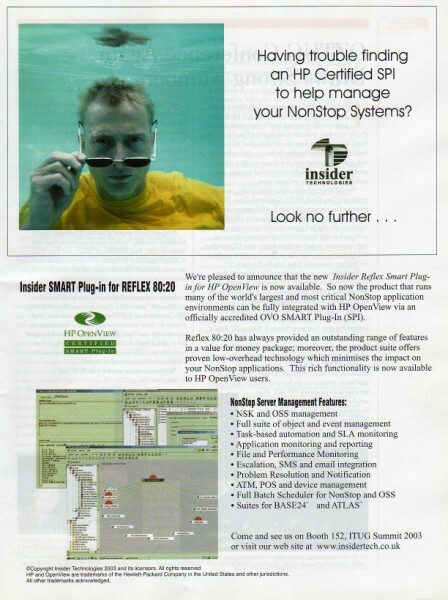 I also produced BASE24-eps™ and XPNET layer Hypervisor displays for both the EBUG and SATUG in 2008. More information. Produced a technical design document and various program specifications for a new ITL product called XPERT24 (XPNET Performance Monitoring and Tracking) to monitor the performance of the XPNET layer of BASE24. This product consists of hp Nonstop PATHWAY servers that both detect and process the XPNET counters currently available for the XPNET layer (rate, state and queue counters) and the transaction interchange counters (approval/denial rates of ATM/POS transactions). I provided both technical and design requirement information to the development team and the product manager assigned to overlook this project. I am currently responsible for installing the product at ACI in Watford for acceptance testing as well as producing the supporting marketing literature and technical user manual for this new product. As a subsequent design phase, I was requested to produce an R&D document for BASE24TM (P)TLF log file analysis and monitoring. The proposed design makes use of the ITL Windows product Sentra to provide the graphical front-end user views with a browser enabled interface. More information. Requested to research and produce a design for integrating the ITL NSK based Reflex 80:20 product with the hp OpenView Operations (hp OVO) enterprise manager. This initially involved a trip to Lisbon to attend the hp OpenView Universe event that represents the technical showcase for this enterprise level product. I then put together a number of design documents and managed a development team tasked with engineering an hp OpenView Smart Plug-in (SPI) to interact with Reflex 80:20 on the hp NonStop platform. This hp SPI approach represents the latest technology for integrating third-party products and provides an unparalleled approach for enabling remote platform control and management under hp OVO. Once the Reflex SPI development was complete, I overlooked acceptance testing at the hp labs at Fort Collins, Colorado and was instrumental in attaining HP certification for the Reflex 80:20 product. As part of the certification process, I produced a comprehensive Reflex SPI user guide along with supporting marketing literature. More information. 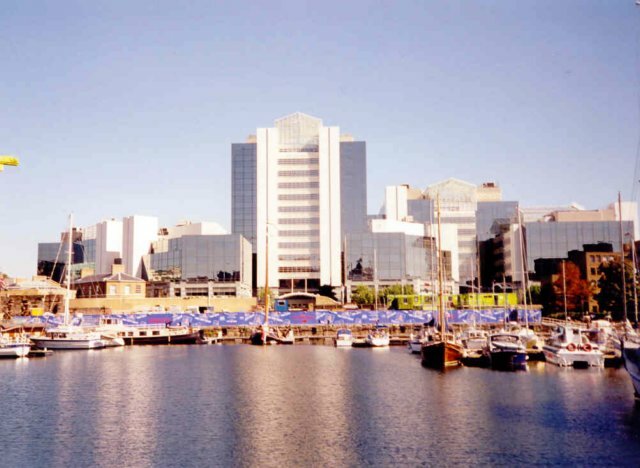 Requested to manage a major bid to replace a 10 year old, in-house developed operations tool, ‘OISS’ used at LloydsTSB, with ITL’s Reflex ONE24 product. This bid is still on going currently due to a management reorganisation at the bank. The current NSK tool manages and monitors the BASE24 environment for the bank. More specifically, the OISS tool looks after the entire ATM estate at LloydsTSB, which consists of 5000 ATMs. The Reflex ONE24 product will require major enhancements in order to fully replace this BASE24 management software. The gap analysis, technical assessment and costing of the project has been part of my current role in the technical initiatives area at ITL. As part of taking the Reflex 80:20 product forward, I was asked to find ‘CPU friendly’ ways of integrating the product with the electronic payment and transaction application BASE24. I designed and engineered a number of PATHWAY Servers that allow Reflex users to automatically detect all XPNET and ICE (by Insession) components and request detailed information and status about them. This is made possible by using a highly graphical WIN32 object tree presentation within the Reflex product and providing point-and-click GUI technology. The solution programmatically interfaces with the XPNET layer of BASE24 using low-cost API calls and allows XPNET EMS events to be mapped to the graphical icons for real-time status. For ICE, the NSK subsystem programmatic interface (SPI) is used to extract ICE components from the NOF (Network Operator Facility) interface. This involved the installation and running of the ICE software in conjunction with appropriate use of ICE DDL libraries shipped with the product. These approaches provide ‘listen rather than interrogate’ methods for BASE24 monitoring. I also produced the technical user guide and marketing literature to support this development. The resulting product is called Reflex ONE24. I am typically called upon for following up sales leads for the Reflex ONE24 product. I have installed this BASE24 enabled product at a number of banks including LloydsTSB, Bank of Ireland, Bank of Valletta (Malta) and both Commercial and Piraeus Bank (Greece). More information. Product Manager assigned to project manage the complete development life-cycle for 4 software products, 2 HP NonStop based and 2 Windows based. This software has its main focus in the system management, automation and SLA monitoring of critical path applications running on hp NonStop systems at major financial and telecommunications institutions around the world. These products are developed by ITL and their ongoing research, design and delivery make up the primary day-to-day role of a Product Manager at ITL, with any issues being reported directly to the Operations Director. This role involves the project management of each development phase of the products and the use of Microsoft Project for tracking progress and reporting status. It is also the responsibility of the Product Manager to provide technical guidance and leadership to assigned team members. Projects I have been involved with include; integrating the NSK product Reflex with both the TIVOLI Enterprise Manager and B&B COMMAND/POST (now BMC Patrol), NSK based comprehensive File Monitoring and introducing comprehensive disaster recovery functions into the Reflex product for site swaps. Development teams are typically made up of between 6-8 technical staff responsible for both hp NonStop and Windows development. The Product Manager is tasked with ensuring that the resulting software meets the original terms of reference as specified by the client or the ITL in-house technical design team. This is carried out in accordance with the ISO9001 quality standard, which necessitates the production of the appropriate paper trails to document work carried out. All Product Managers at ITL are accountable for each development area and are subject to internal and external company audits. Consultancy / Pre-Sales – Ongoing input to marketing and pre-sales activities for major bids and also existing accounts to ascertain the path forward for ITL products. This has involved a trip to South Africa (1999, 2008) to promote interest in ITL products and several visits to London and Europe. I have also attended the ITUG in San Jose and the EBUG conferences to promote the BASE24 enabled ITL product set. As part of an in-house consultancy team, helped extend a new ITL NSK reports suite using Crystal Reports and corresponding Microsoft SQL stored procedures. Training and Demonstrations – The provision of technical training to customers and staff both in-house and at customer site. 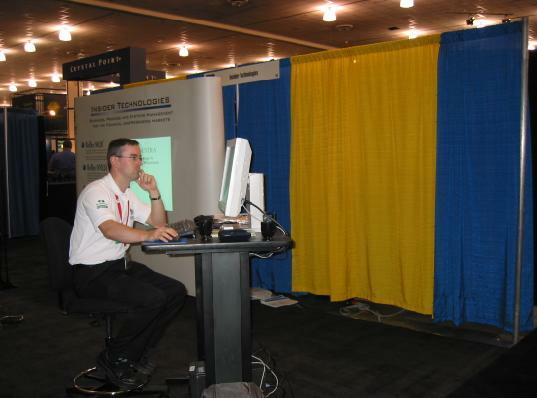 Assisting the marketing division with product demonstrations to potential clients as well as participating in major, NSK related technical conferences. Helpdesk support – Interfacing to the ITL Helpdesk to aid their handling of customer queries and problems relating to previous releases of ITL products. This requires the assigning of live software problems encountered on client sites to appropriate ITL staff, and the update of current project plans to reflect impact to ongoing in-house developments. I am also involved when software problems require an on-site presence in order to look further at issues that cannot be replicated in-house. Live Product Support – Providing 7 * 24 hour cover for major clients who make use of ITL software as part of their system management (Reflex) and batch management (MultiBatch) strategy. My first project management task after my 3-month placement at CRESTCo (now Euroclear) in London, involved adding Management Reporting capability to the Reflex 80:20 NSK system-monitoring product. This was the first Insider Technologies initiative to link the NSK platform with a remote Windows server for MIS reporting functions. PATHWAY servers were designed and engineered to relay NSK metrics extracted by Reflex, to a Windows Microsoft SQL database. This allowed for the generation of both tabular and graphical reports on NSK platform performance trends between user specified dates. My role as project manager involved the design of the overall NSK relay architecture and managing the staff assigned to the project and their individual tasks using Microsoft Project. All project status and issues were reported to the Operations Director. Placed at CRESTCo (now Euroclear) in London (contracted out as a consultant by Insider Technologies Limited) producing volume testing and benchmark software. This software was used to test the overall performance of their Stock Settlement application on the new S7000 hp NonStop nodes (first delivered in the country). The results obtained were compared with their existing live K class systems running the same application. On-site at CRESTCo for 3 months. After the design and development of the graphical Status Monitoring software detailed below, I completed a C/C++ course in London. The reason for attending this course was so that I could start to look at porting some of the Guardian proprietary system monitoring software running on the hp NonStop platform, to Windows workstations running NT. Insider Technologies had successfully developed highly graphical hp NonStop system monitoring and automation software for the Operations Bridge to check the status of NSK objects and subsystems. The business side of ITL’s accounts also wanted to view actual service provision and availability as well as the component level hp NonStop status information. My task was to produce a Service Monitoring suite of software which would allow for the display of NSK objects running on various hp NonStop nodes in a cross sectional, service based representation. This was my largest undertaking to date and involved the production of an SQL database storing data driven rules allowing for BOOLEAN logic to be applied to NSK based objects for cross correlation and comparison. Various PATHWAY C and C++ servers were written to collect status data. This data is then applied to the rules database in order to ascertain whether or not a service is in danger of becoming critical based on the components that make it up. The GUI representation followed a ‘Windows Explorer’ look-and-feel. A set of GUI screens were constructed to allow for the building of rules to apply at run time to NSK based entities in each service object tree. The C code on the hp NonStop platform uses embedded SQL to access the Reflex database. Queuing servers written in C++ were developed to forward pertinent object information from child NSK nodes to a nominated control node were the data could be parsed, interpreted and applied. This was the first time ITL had developed C and C++ PATHWAY servers on the hp NonStop platform and experience in this area of NSK programming is still hard to find. More information. Responsible for designing and subsequently team leading a development team of hp NonStop and Windows programmers in the production of graphical NSK Status Monitoring software to be incorporated into the Reflex product. This software allows for the registration of various hp NonStop system objects, e.g. CPUs, Disks, Processes, MultiMessage objects, Communication Lines etc. and the subsequent monitoring of their status and health. The TAL PATHWAY server accepts input from a number of NonStop processes and a GUI interface in order to provide the latest real-time status information. 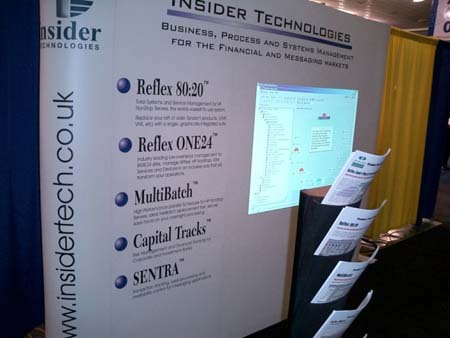 This was the first SQL project that Insider Technologies entertained. I was responsible for setting up the SQL database and constructing it in such a way as to allow for a ‘File Manager/ Windows Explorer’ type front end. This meant that hp NonStop objects could be grouped by type and viewed by way of drill down trees. The software is now running at a number of sites including the Bank of England and CRESTCo (now Euroclear) and is used by Operations Bridges to inform on the state of critical NSK objects and the overall status of selected NSK nodes. More information. After the TAL course I was asked to write a PATHWAY server in TAL which could start up a number of EMS distributors on request, to allow for multiple user event views of a hp NonStop system. This involved SPI programming in TAL to attach collectors, filters and timestamps to distributors and subsequently populate internal buffers with the latest EMS information. This console offers all of the features of the hp NonStop product Viewpoint but also with a GUI front end. Also provided is the ability to breakdown events into their appropriate tokens (like the hp NonStop EMSA product) and search events based on elected token values. I was responsible for conveying the GUI front-end interface requirements to the Windows team assigned to the project. This Event Console is now part of the Reflex product and allows events to be copied into the Reflex database. The event can then be configured against a Reflex reaction, e.g. generate an SMS message or email. The Event Console is also available as a separate product. More information. My first tasks at Insider Technologies involved the design and production of a number of SCOBOL requesters and the updating of the pertinent COBOL85 servers. These requesters poll at a configurable rate, for the latest performance and status details of hp NonStop system CPUs and various Disk and Processes and subsequently display this information to the operator by way of the Reflex product. A GUI front end was produced and it was my task to convey the necessary Inter-Process Message and format information to the GUI team assigned to produce the PC front-end. I also developed two SCOBOL requesters and a Pathway server to secure Reflex tasks so that only authorised Guardian users could execute them via the Reflex GUI interface. This layer was developed so that another level of security could be introduced into the Reflex product. More information.